Professional Radionics Software with POWERFUL Features. It is just like Super Manifestation minus a few advanced features, with 5 fixed positions. and many pre-built operations.. Plus you can make your own! NOTE: Should you decide to upgrade to Super Manifestation ultimate 2.1 later you will received FULL CREDIT for your purchase of Manifestation Pro so there is no downside to starting with Manifestation Pro and upgrading later. This is an instant download version. Shortly you will receive an email with a link to download the software. You can not use the software without your Chi Transfer Diagram. The Chi Transfer diagram is REQUIRED to run the program! Your Chi Transfer diagram will be personally emailed to you by us. We strive to send them out as soon as possible. It may only take minues or a few hours. Depending on the time of day when you place the order it could take up to 14 hours. You will need to print a copy (ONE AND ONLY ONE) copy of the Chi Transfer diagram to place on your Welz Chi Generator. Do not print more than one or you will damage the structural link! If you wish to have a Chi Transfer Diagram CD and printed, laminated copy be sent to you use the option selection below. Manifestation PRO is the new program from RadionicsBox and HSCTI. 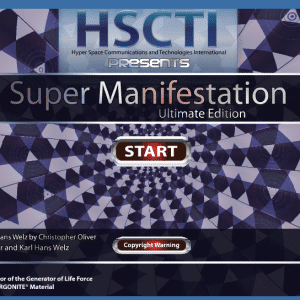 It is the younger sibling of the top of the line, SUPER MANIFESTATION ULTIMATE 2.1, and built on the same codebase. Manifestation is a powerful radionic modeling program based on the 5 position design. It is just like Super Manifestation minus a few advanced features, with 5 fixed positions. Best of all it comes with many pre-built templates ready to go. You need only to add your target image, text, and dial your rates! A large selection of pre-built operations are included to get you up and running operations quickly. REMEMBER YOU CAN ALWAYS BUILD AS MANY AS YOU WANT OF YOUR OWN! This package includes all of the filter card images as well as MANY MANY more that are not available as filter cards… The entire alphabet of desire packs, planetary squares, astrology, Feng Shiu, King Solomon, Abramelin squares, fixed stars, elements, crystal spirits, gnostic, iching, kabbala, Shinto talismans, RUNES, voodoo, tarot, chakras, and more.